This post is part of a series on reader requested (and personal curiosity) comparisons between Fire Emblem games’ Japanese and English scripts. 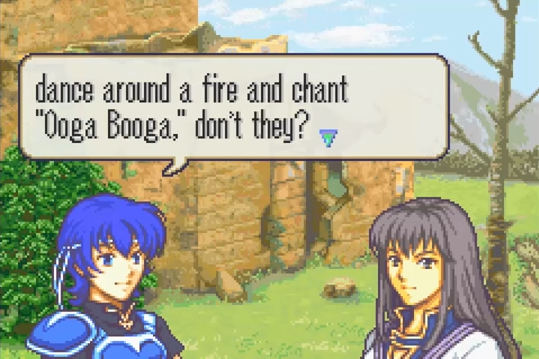 Last time, I looked into a bit of Farina and Karla’s support conversation from Fire Emblem: Blazing Blade (FE7). “I recall reading…. somewhere…. that they changed Garcia and Dozla’s support conversations to remove alcohol references. I have heard of this too, but never looked into it. 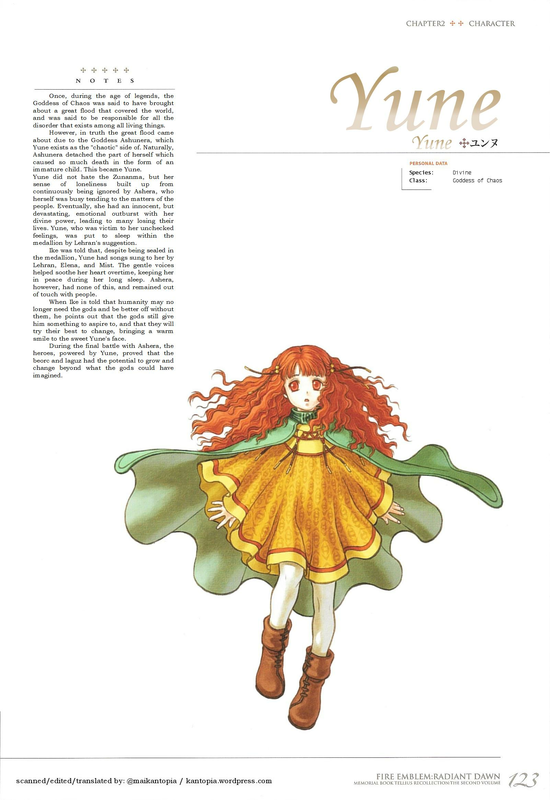 It’s listed under trivia on Garcia’s page on the Fire Emblem wiki, for instance, though it lacks any citation. This is part of a series of comparing the Japanese and English versions of the game. Read more about that here! And feel free to leave a request or curiosity on the comments here or on that page. The section question regarding Legend of Zelda: Breath of the Wild comes from personal curiosity. 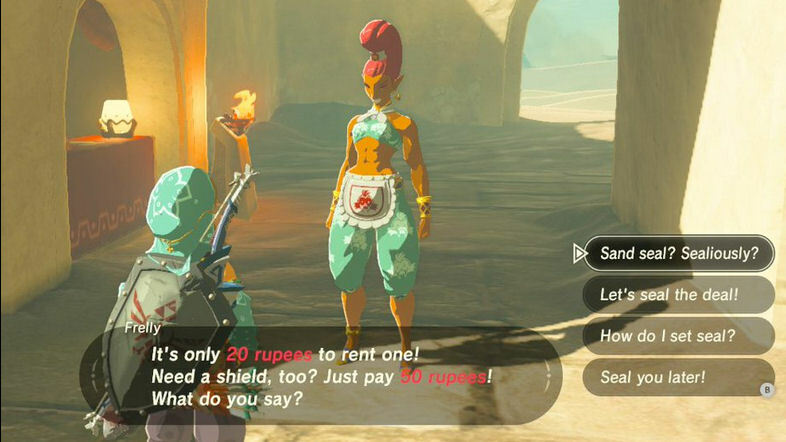 So in the Gerudo Town in the game, there is a woman who sells sand seals. She makes quite a few puns (as seen on the image at the top of the page), and so I’m sure many were curious at what that may have been in Japanese. So let’s take a look! This post is part of a series on reader requested (and personal curiosity) comparisons between Fire Emblem games’ Japanese and English scripts. Last time I covered Python’s “ginger stud” line in Shadows of Valentia. How does the part with Farina going, ‘Ooga Booga” go in Japanese? This sounds like a fun investigation. So let’s get to it! This post is part of a series on reader requested (and personal curiosity) comparisons between Fire Emblem games’ Japanese and English scripts. Last time I covered the “Shut up, Tobin” scene between Gray and Tobin in Shadows of Valentia. 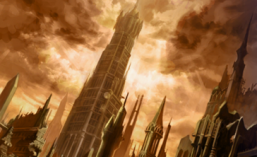 Today’s post has minor spoilers from part one of the game. 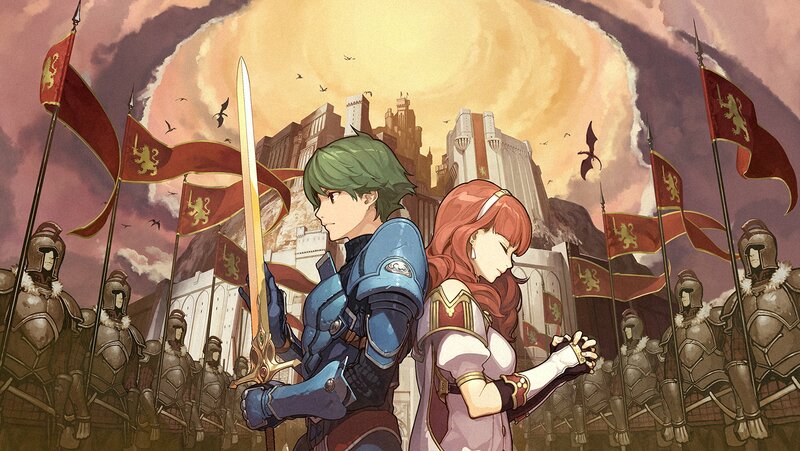 This post revolves around the first encounter with the character Python in Fire Emblem Echoes: Shadows of Valentia. A reader contacted me on this blog and requested for me to check a line from this scene. What’s up with Python calling people studs all the time? How does he speak in Japanese/what led the translators to make the choices they made? While the reader requested to look into the “studs” specifically, I also look at some other dialogue in the same scene to give a better sense of perhaps what the localization was going for, so it may be a bit broader than this question specifically. Please remember this is not a nonconstructive criticism of the localization, nor do I aim to purport which is necessarily better or that you should/must like better. Any comments I make along those lines are simply my personal opinion that you can feel free to disagree with as need be. : ) These are fun observations. This post is part of a series on reader requested (and personal curiosity) comparisons between Fire Emblem games’ Japanese and English scripts. Last time, I covered some dialogue Mae says during her recruitment. This time, I check out a scene with Tobin and Gray. It took several months, but I’m proud to say every profile, piece of concept art, full-body portrait, and extras of interest from Tellius Recollection: Volume 2 is now complete! It’s always a nice feeling completing a long term project such as this. A big thanks to the people who donated so I could get a second copy of the book and de-spine it for higher quality scans! I wish that was something I could do for all my other projects too… such as for my 4koma and other art book projects. If you feel like supporting me and getting spare copies of books to de-spine, or if you just like what I do in general, then please consider donating! Now, you can download all of the translated pages of Tellius Recollection Volume 2 in bulk. See the links below! One last thing, if you want to share the project, please link back to the main blog post in some way. Thank you all so much! See you next project! Or see it all in one imgur gallery here.